This is one of those Fridays where I’ll write about something else than developing, so if that’s what you were hoping for, stop reading now. However, if you feel that there’s more to life than web development and the internet, please keep on reading. Like off-topic posts? Love ’em, hate ’em? Let me know! As I’ve written before, my girlfriend and I went on a long trip in 2002. 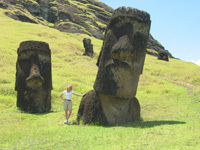 One of the places we went to were Easter Island, which is really an amazing place! I had wanted to go there since I was a kid, when I read a “Kalle Ankas pocket” (Donald Duck comics in a paperback format) that took place there. Seeing all those gargantuan ominous-looking stone heads made a shiver ran up my back, and with that tingling feeling I knew I would travel there one day! Easter Island, also known as Isla Pascua or Rapa Nui, is one of the most isolated places on Earth, located 3700 km from the Chilean mainland. You can go 1900 km in any direction from the island without coming across inhabited land (that’s about 1178 miles for you US readers). The earliest settlers called it “Te Pito O Te Henua”, meaning “Navel of The World”. It’s a tiny island with a population of only around 2000 people. 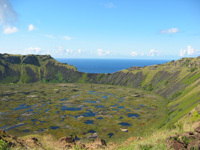 There are also two giant volcanoes on the island, where I really love the immensely beautiful Rano Kau! We flew there from Santiago, Chile, but unfortunately we didn’t have seats by the window. Of course, everyone wanted to see the statues from the air plane but as I remember it, no one saw them from the plane. Before we left Sweden, we had booked a guide and a three-day programme for seeing and learning as much as possible about the island. When we landed in the afternoon, our guide, Hermann (I don’t think he was originally from Germany, but he spoke German, Spanish and English), met us at the airport, and a driver of his with a mini-van drove us to our hotel. Once at the hotel, we asked if there were going to be any activities that afternoon, but we got no as a answer. After we had settled at the hotel, I decided to go look for a statue. I mean, I had been longing to see them since I was a child, there was no way I could wait one more day! Fredrika, my girlfriend, wasn’t as eager as me, so she decided to chill by the hotel pool instead. I looked at the hand-drawn map I got earlier (which didn’t have any statues marked on it) and took off in the direction that felt right, with a bottle of water to keep me going. I started walking along the coast, up an enormous hill. After about fifteen minutes of walking I encountered a small run-down fence. There was no way I was turning back now, so I climbed the fence and continued. I walked further and further up the hill, and every time I reached a ridge that I believed to be the top, another higher part of the hill revealed itself to me. After about two hours of walking, and no water left, I finally fought my way through some bushes and came upon a gravel road. I followed it to the right and came to a stone fence after five minutes of walking. There was a sign that said it was a national park and that I had to pay an entrance fee to the guard in the small stone house. Since I a) didn’t know what was on the other side of the fence, and b) already had paid for a tour, I didn’t think it was a good idea. Instead I managed to get my way through some shrubbery and got my first, half-obscured, look of Rano Kau (see first picture in this post). After the long walk I was exhausted, and walking the same two hours back the way I came didn’t feel like an option. I could try and walk the gravel road, but I wasn’t sure how far that would be, nor where it would lead me. Standing hesitantly by the end of the road, by the stone fence, pondering my options, I spotted a guy with a cap and a moustache. Seeing the raggedy state I was in, he asked me if I wanted a ride back. Man, did I! I hadn’t seen any statues after all my efforts, but by then I just wanted to get back to the hotel. He got into his jeep, and on the way back I learned that he was a photographer, traveling around the world to places like Easter Island, taking pictures and then selling them. That’s a job I’d love to have! He dropped me off at my hotel and I stumbled towards the hotel pool. No Fredrika. I went to our hotel room. No Fredrika. I went around to the back, looking in from the patio door. No Fredrika. Gone on a tour. Don’t know when I’ll be back. I didn’t find her in the city center, so after some moseying around, I walked back to the hotel again. After sitting apathetically on the bed for a while, Fredrika walked in through the door. It turned out that there was indeed a tour that afternoon, and just after I had started on my strenuous walk they had come to the hotel and driven her and some others around to see some moais (statues) and the museum on the island (where I still, to this day, haven’t been…). Eventually, though, we got to see a lot of moais and it’s a visit I’ll never forget! It even exceeded my expectations I’d had for twenty years or so!